Business description - Sarveshwar Foods is primarily engaged in the business of processing and marketing of branded and un-branded basmati and non-basmati rice in the domestic and international markets. Its operations are based out of the Jammu Region in the State of Jammu and Kashmir. In addition to its home state, the company procures Basmati and non-Basmati paddy from Punjab, Haryana, Himachal Pradesh, Uttar Pradesh and Delhi. Besides conventional Basmati and non-Basmati rice, the company has also forayed into procurement, storage, milling, sorting, packaging, branding and distribution of "Organic" Basmati and non-Basmati rice. The "Organic" business also includes organic food products such as dry fruits and nuts, pulses, lentin, flours, porridge, spices, garam masalas and super foods like chia seeds, flax seeds, quinoa seeds, etc. The company markets and distributes these organic food products under its brand "Nimbark". 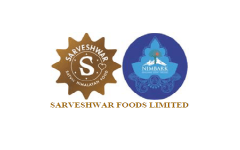 Sarveshwar Foods IPO allotment status is now available on Bigshare Services' website. Click on this link to get allotment status. has the refund been initiated ? only .40 times subscribe till 2nd day… worth investing company………. Great company, great financials. Share price will surely double in next 3-4 months.